It is migratory, with birds in the northern part of the range migrating as far south as Borneo during winter. Locally common in southern parts of its range, the Ruddy Kingfisher is rare in Japan, where it is highly sought after by birders. 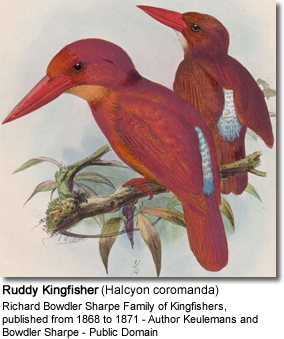 Ruddy Kingfishers inhabit forested areas from the temperate to tropical zones, often in thick jungles and rainforests. Due to its preference for heavily forested areas, the kingfisher's high, descending call is more often heard than the bird itself is seen, and these birds generally travel singly or in pairs. Reaching approximately 25cm, the Ruddy Kingfisher has a very large, bright red bill and equally red legs. 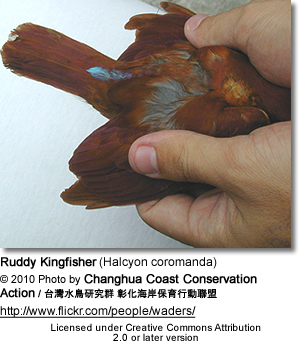 The body is rust red, generally deepening to purple at the tail. There is little sexual dimorphism though some sources state that male birds are somewhat brighter in plumage. 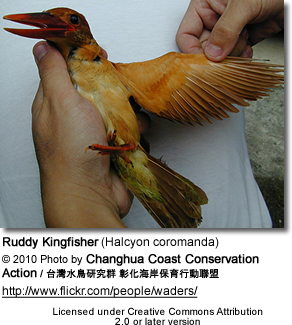 Like other kingfishers, Ruddy Kingfishers generally feed on fish, crustaceans, and large insects, though in areas with less running water, they are known to take frogs and other amphibians. "Halcyon coromanda". Integrated Taxonomic Information System. http://www.itis.gov. Retrieved 4 February 2006. Shimada, Tadashi. 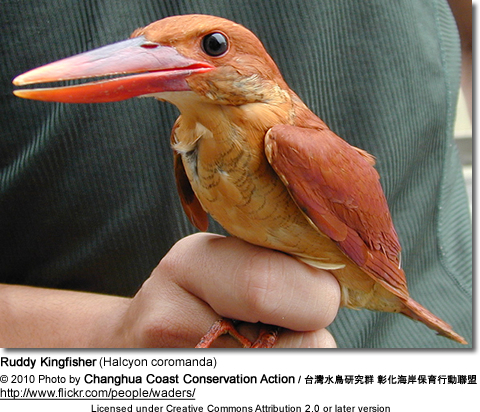 Hi No Tori, Akashobin (Ruddy kingfisher). Heibonsha. ISBN 4582529151. 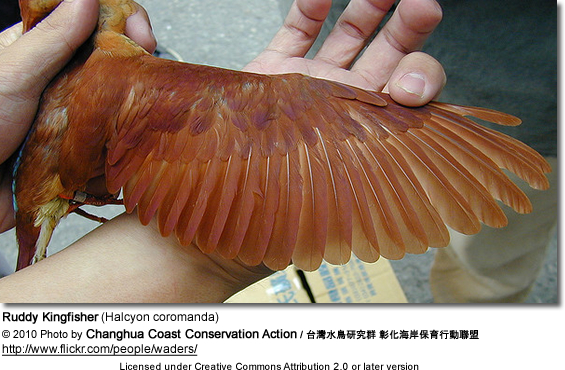 - a photographic essay on the ruddy kingfisher, in Japanese.